SwiftSure Timberworks specializes in handcrafted mortise and tenon joinery using the finest of timber materials—including reclaimed Douglas fir. The relatively small size of our shop permits us the flexibility to take on custom orders of varying size and complexity, and means we have no need to adhere to a set of stock floor plans. 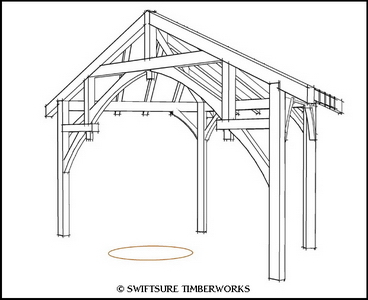 Whether you plan to build a full timber frame home, or need only a simple timber truss over your entry porch, SwiftSure Timberworks will work with you and your designer or architect to develop a set of detailed shop drawings of the timber elements of your project. SwiftSure’s design department is fully computerized and is set up to share electronic files—including 3D modeling—with you and your project’s design professionals during all phases of the design process. As a result, communication is streamlined and efficient, and it takes less time to complete a set of “permit-ready” construction plans. If you don’t already have a designer or architect, SwiftSure offers its own design service, and will put together your set of construction plans from start to finish. Most cities and counties require structural timberwork to be checked by a structural engineer. We work with a number of structural engineers who specialize in timber joinery, and we can provide you with the structural analysis you’ll need when you apply for a building permit.